At the request of Holy Trinity, the Borough of State College has lifted the 2 to 6 a.m. on-street parking ban on all the surface roads surrounding the church. In addition to on-street parking on North and South Sparks Street, other suggested places to park include Patterson and Gill Streets, Nittany Beverage (139 N. Patterson St.) and the former Montessori School (300 S. Sparks St.). 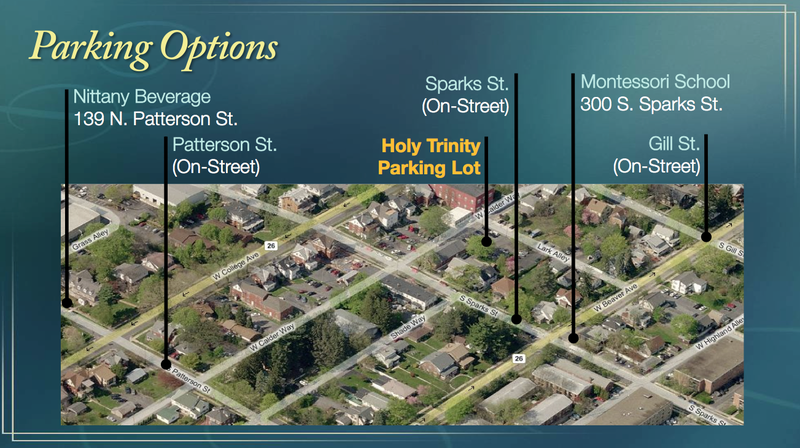 All the spaces in the Holy Trinity lot, including those accessible by Calder Way (numbered 10 through 18) are also available. Tonight’s Divine Services for Great and Holy Pascha begin at 11:30 p.m. with the chanting of Nocturns. Following the rush procession, the celebration of our Lord’s Resurrection continues with Matins, Hours, and the Divine Liturgy sung in quick succession. The blessing of baskets and a festal meal follow in the Parish Hall.